Like a bullet in slow motion, she floated over treetops for as long as it took to blink. A gothic fairy tale of spiritual connections, mystical protectors and escaping the clutches of a monster, this is the opening line of Brenda Clews’ mesmerizing, magical novella Fugue in Green, published by Quattro Books. Teen siblings Steig and Curtis struggle to survive live with their cruel, controlling and abusive mother Leica while their filmmaker father Reb is away working in England. Their monster mother is a catalyst for Steig’s escapes into the woods that surround their Vermont home, where Steig finds solace in nature. It is in these moments that we learn that Steig is a magical, elemental young woman who becomes the landscape she loves and shelters in. She also sees ghosts: her grandparents and a former teacher. And the ghosts tell her things. And she has a spritely sentinel: a bird man called forth from her connection to the woods to be her guardian. Reb lives and works with his dreams—and dreams while awake—the everyday becoming surreal, expressionist visions that surround him; a visual poet, he creates poetry with images instead of words. And what of the mysterious and angelic Clare, a magician with a camera who arrives in his life at the precise moment he needs her—both personally and professionally? Steig’s younger brother Curtis busies himself with more traditional, earth-bound teen pursuits. While not fully immune to their mother’s unreasonable expectations, unpredictable behaviour and wrath, he bears the least of it. And when their mother goes too far with Steig one day, Curtis launches a plan to flee their mother, contact their father and join him in England. Their journey to safety is fraught with terrifying memories and shared visions, but is also protected by forest spirits. Secrets are revealed—with devastating results. Reb had no idea about the child abuse going on in his own home; forced to move beyond his own sense of guilt of being so distant from his children, who he realizes he barely knows, he’s determined to make a safe, supportive home for them. He’s been away too much and for too long. Meanwhile, back at the family’s home in Vermont, and realizing that her children are gone, Leica flies into a spiralling, destructive rage that echoes across an ocean. Supernatural, spiritual connections emerge and reveal themselves; the battle between order and wilderness embodied in the relationship between Steig’s mother and Steig—and even Reb. Love, family, myth and metaphysics intertwine, winding around these relationships as the two children escape the witch at home and into the arms of those who truly love them. Magical, sensuous and seductive, Clews’ words swirl around you and draw you in; mesmerizing with evocative colours and haunting, ethereal—and sometimes disturbing—images. A short, gripping modern fairy tale, it’s perfect for curling up for an afternoon or evening read, easily finished in one sitting. Clews is also an artist and a poet; you can view her work on her website, and on YouTube and Vimeo. You can also connect with Clews on Twitter and Facebook. Humans react and respond to their environment. 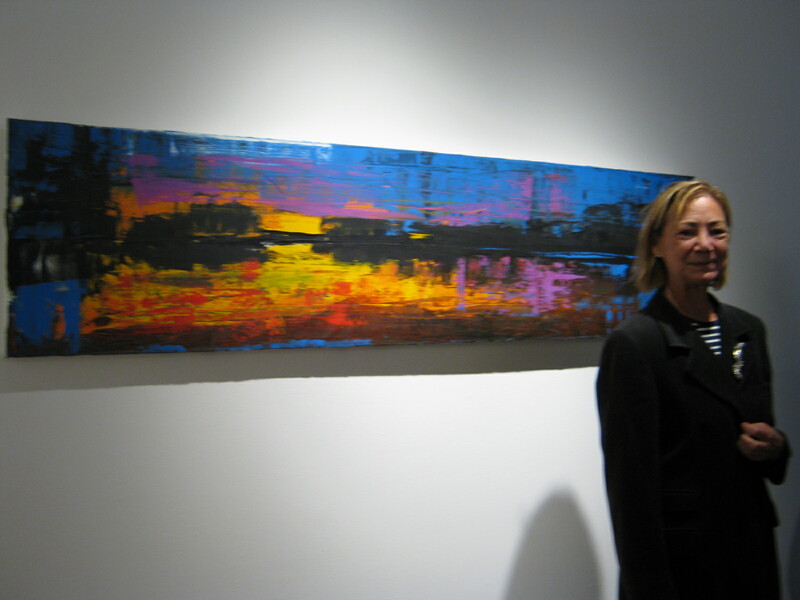 Abstract expressionist Nora Camps launched a unique exhibit of her work, along with guest artist Avril Bull-Jones, last Thursday night: Mediated Space at Arbitration Place. The site-specific show had an opening reception, and from there will be an immersive experience for those who work in and use the space. The idea came from an experience Camps had when her work was incorporated into a house staging a few years ago. When the buyers took possession of their new home, they were distressed. The space didn’t feel right. Something was missing. Turns out, what they were missing was the paintings. 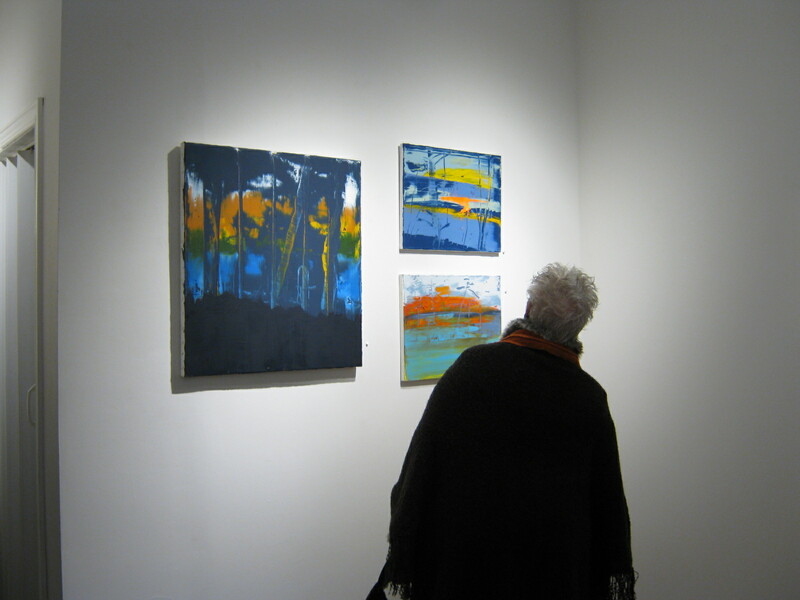 In the initial showing of the home, the paintings impacted how they perceived and responded to the space. Arbitration Place is a dispute resolution facility, equipped with a series of hearing rooms, and a staff of resident and member arbitrators, and in-house legal support, as well as a concierge administrative/services team. Two parties will meet to resolve an issue – and although this is not a trial setting, strong emotions and high stakes will still come into play. How will the presence of these works transform the space and impact the rapport between the arguing sides? Camps and Bull-Jones are two very different artists, with divergent approaches and media. There is an intensely deep, expressively dramatic feel to Camps’ work, while Bull-Jones’ pieces have an organic, storytelling quality, at times nostalgic and whimsical. And yet, both artists create works that are rooted in a personal response to nature and the space around them – engaging, moving and evoking a response in the viewer. Abstract expressionist Camps works mainly in acrylic, with pieces ranging from the shimmering, luminous and textured Flowers Silver to the deeper, dramatic palate of Red Trees Reflected, to the sensual and organic touches in On Pond and Below Sea Level 3. 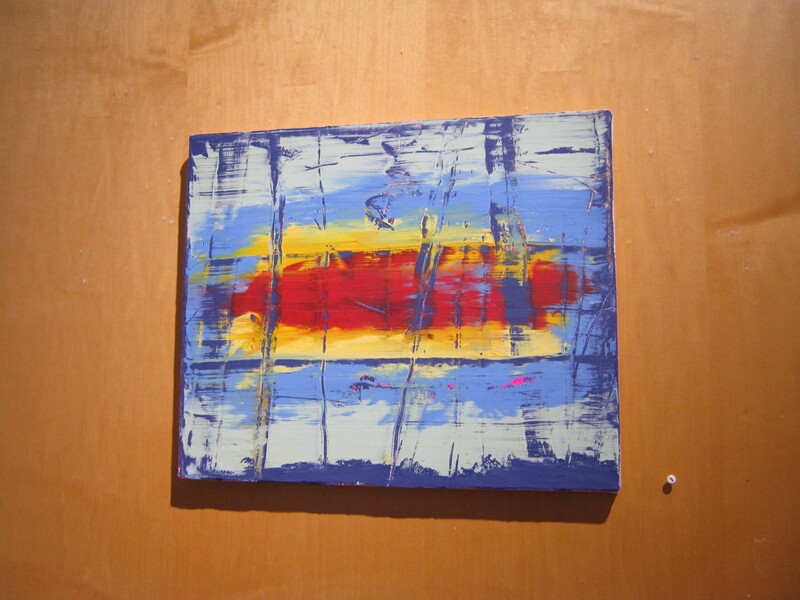 Interesting dynamics emerge in how the works are placed in the space (in the reception area, hallways and hearing rooms): Red Trees Reflected is hung opposite Blue Portal in a startling and moving contrast of hot and cold, with the Blue Portal canvas revealing tension of its own, as a red horizontal line cuts across an oceanic blue and white background. Bull-Jones’ work incorporates a variety of printing processes, as well as acrylic and watercolour, creating images inspired by the patterns and dance of nature. Falling for You is a whimsical portrait of falling leaves. Contrast is evident here as well, the cool blue background of the falling leaves in Plunging Lines hangs in the same room as the hot, organic orange and cinnamon of Balanced Sizzle. There are scenes of anthropomorphized flora in the nature love-in So Special and the emerging figure in In and Out; and an illustration style in the fable-like Mystical Universe, where four elephants ride a sea turtle. As these spaces get used over the course of the exhibit, I imagine these works acting as both flies on the wall and catalysts to the nature and tone of the proceedings that unfold. A lovely combination of luminous, organic and abstract – vibrating with colour and tension – in Mediated Space. It was a lovely evening to be at an art opening last night, out of the rain and inside the warm, intimate exhibit space at the Fran Hill Gallery for the opening of Inez/Recent Paintings. I’d had a sneak peek of the exhibit when I dropped by the gallery to pick up my Blair Sharpe painting a couple of weeks ago – and also met Inez – and I was struck by the vibrant colours, the contrasts of light and dark, and the strong strokes in these beautiful renderings. Inez’s canvasses celebrate the awesome power of nature, as well as its beauty, and with almost whimsical touches – details like the red canoe in “Mazinaw Rock,” dwarfed by the enormous rock face behind it. 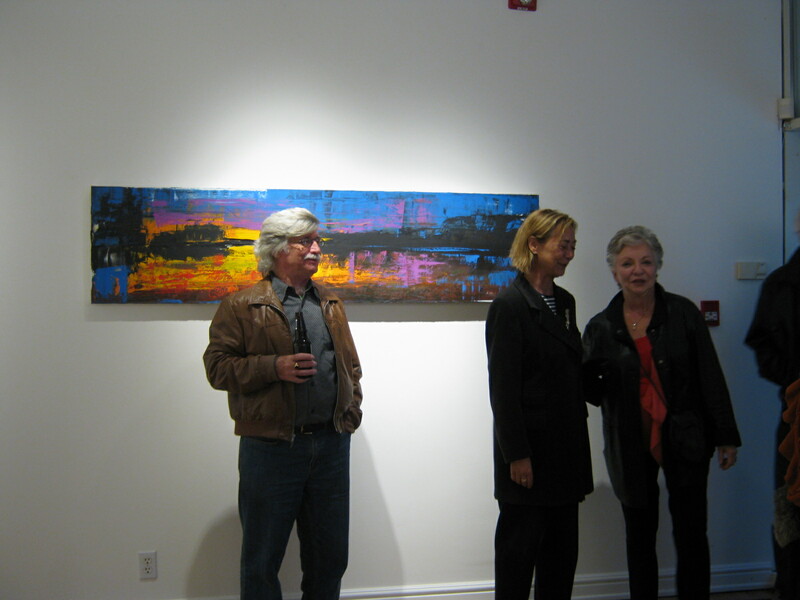 There are also canvases featuring Fraser Lake – and each has a different mood. Lighter colours – pink and orange – in some, while primaries and darker blues and purples dominate in others. 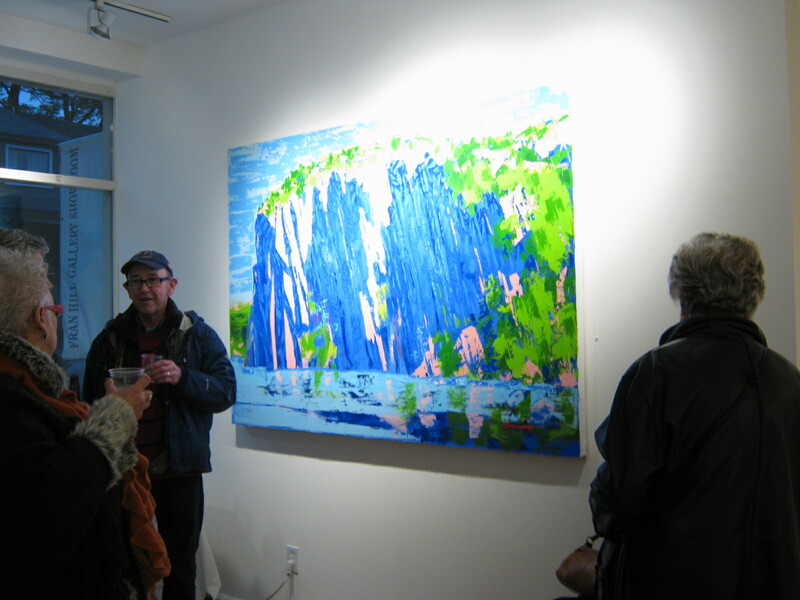 When I returned to the gallery last night for the official opening, there were lots of folks present – friends, fellow artists and folks from the neighbourhood – also friends of Fran and the gallery – a great, diverse group of people coming out to support the artist and admire her work. The gallery itself has a cozy, intimate feel where strangers make each other feel welcome – this is thanks to the gallery’s convivial owner/host Fran Hill, who is always happy to meet new people, introduce you around and make sure you have a beverage. And the fancy sandwiches served at the opening last night were made by the artist, with the help of some friends. While I was there, Fran introduced me to artists Alex Cameron, who has a show on at the Moore, and Brian Saby, one of the other artists she represents at the gallery. Another great night of art and friendly folks supporting the artist at the Fran Hill Gallery. This is one of my favourites – and it sold last night! 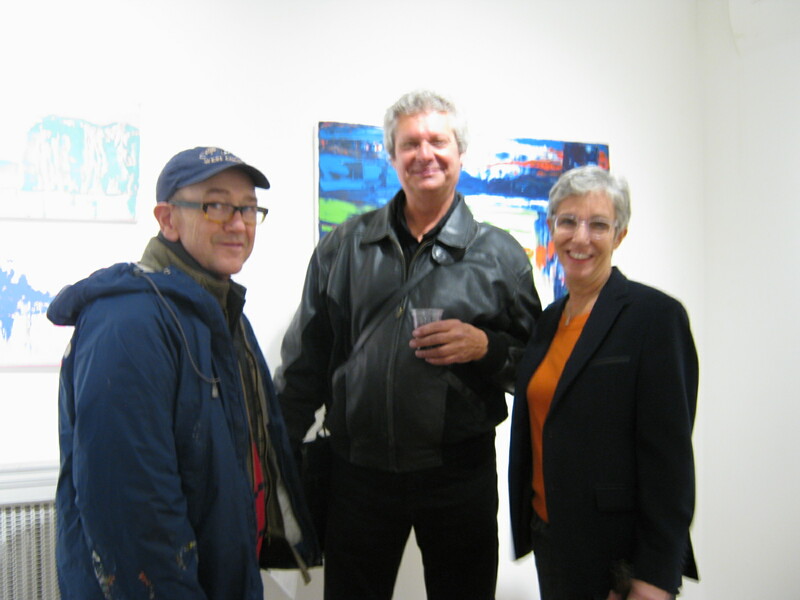 Artists Alex Cameron, Brian Saby and Inez.